ApriliaForum - How to replace your sprag clutch. I just replaced my sprag clutch this weekend. After reading numerous posts on the forum, I was prepared to see a mush of oil, ground up metal parts when I pulled off the my alternator cover. Fortunately, my clutch failed in a "safe" manner. 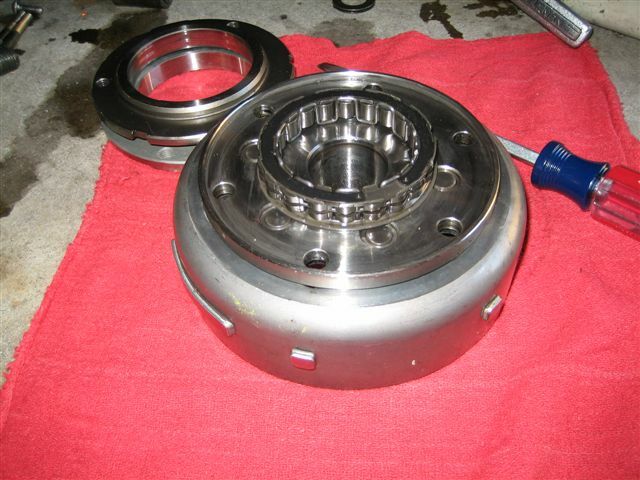 Meaning the only parts damaged was the actual sprag clutch and the bearing housing. Total cost outside of tools: $315. I used the Aprilia sprag clutch housing and the Ducati sprag clutch. Since there seems to be a lot of people who have done this repair and said "it's not that hard" but don't post pics, I thought I would try and reverse that trend. Here's my write up of the repair...with pics. Various smaller Allen keys (4,5,6). 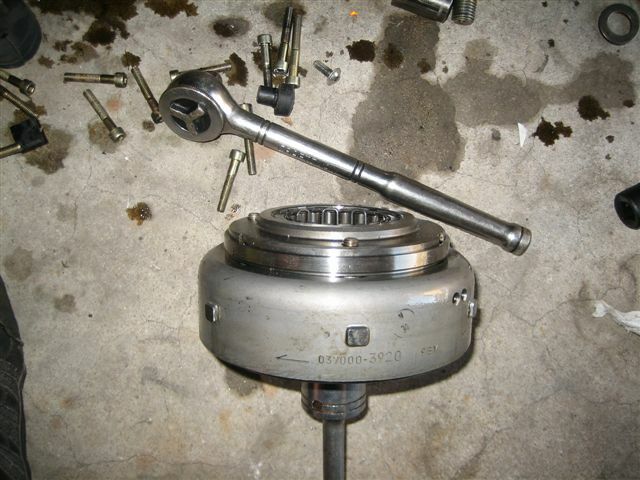 Sprag clutch (Ducati equivalent: PN 70140071A about $170 via local Ducati dealer). Locktite 243 if you remove the alternator from the cover. Aprilia V990 engine manual (only $8 download from AF1). Disclaimer: this is just a guide and I do not claim that it's all comprehensive. Get the manual and follow the directions regarding torque and use of locktite. Do not even think about starting this job without both the bike shop manual AND the V990 shop manual. If you haven't done something like shimmed your values, just take it to the dealer. It took me about 2-3 hours which means, a good Aprilia tech should only take 1.5-2. 1.1) Check for metal particles in the oil. 4) Remove the Alternator cover. If you can't disconnect the alternator, unbolt it from the cover and hang it on your frame slider. DO NOT UNDER ANY CIRCUMSTANCES USE THE STARTER!!!! YOU WILL CAUSE MAJOR DAMAGE TO YOUR ENGINE!!!!! 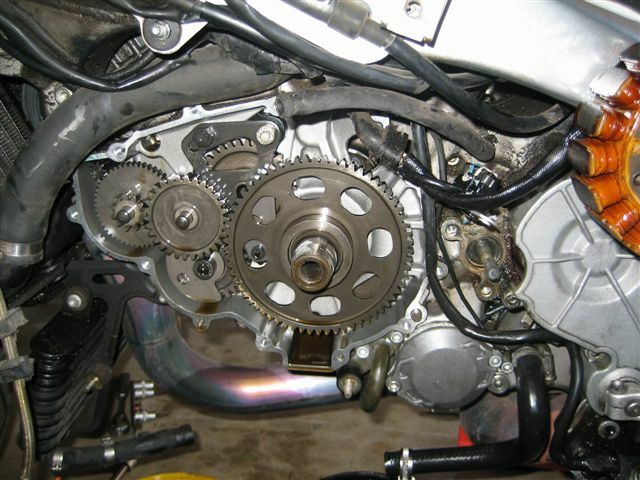 5) Check the Sprag clutch operation. 5.1) Pull out the intermediate starter drive gear. 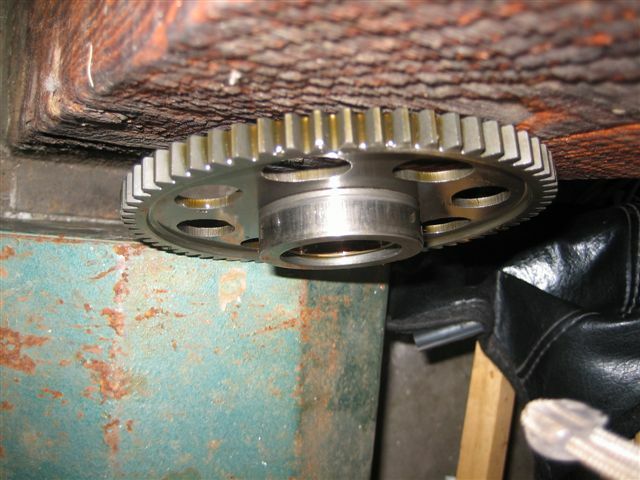 5.2) Try to turn the sprag drive gear. It should turn smoothly in one direction only. This by no means that the sprag clutch is good. 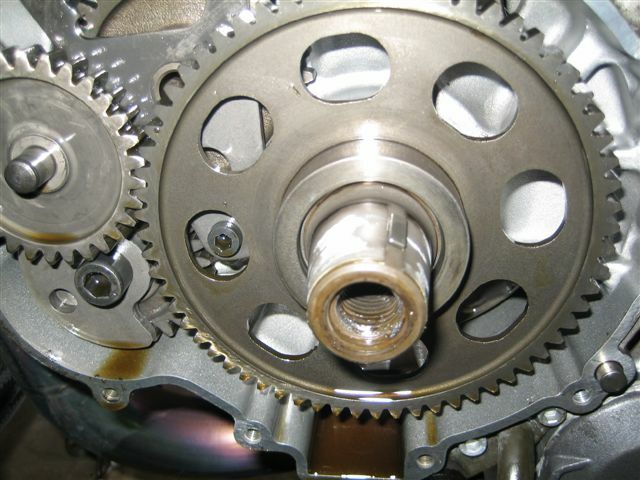 6) Check the condition of the gears between the starter and the sprag gear. 6.1) The gears take a huge beating if the sprag clutch is failing or if someone tried to start it with the cover off. 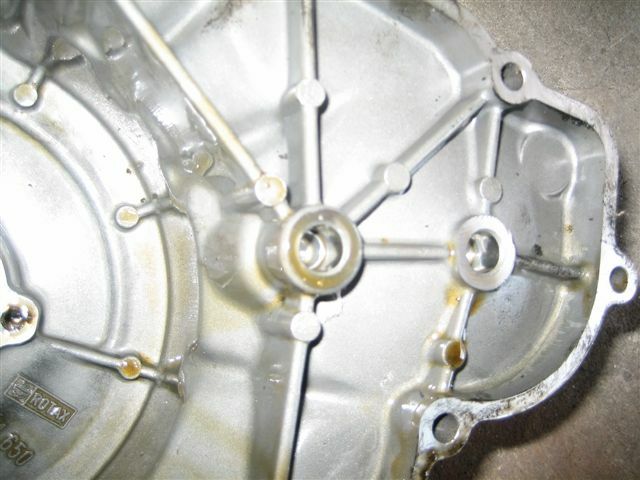 7) Check the condition of the gear shaft bosses on the alternator/starter cover. 8) Insert the Aprilia Crank Holding tool on the right side of the bike. 8.1) turn the crank till either the front or rear cylinder is at TDC. 8.2) screw in the tool (an M8 wing nut bolt)till it stops. 8.3) Move the crank back and forth a little till you feel the notch in the crank. 8.4) You should be able to screw in the bolt for 2-3 more turns. This will hold your crank still while you remove and replace the main M16 bolt holding on your flywheel. 10) Loosen the bolts holding on the sprag bearing housing. 11) Use the plumber's torch to heat up the center of the flywheel with the bolt removed (it took me about 1-2 minutes, till it just started to turn a little brown). 12) Quickly screw in the puller and use the long breaker bar (2-3ft) to apply a medium amount of torque. NOTE: it didn't take too much torque to get it off. Be careful not to strip the threads in the flywheel. WARNING: The flywheel will be VERY HOT!!!! Handle with care. I let it cool for a while before disassembling the flywheel and sprag clutch. 13) Remove the sprag bearing housing from the flywheel. 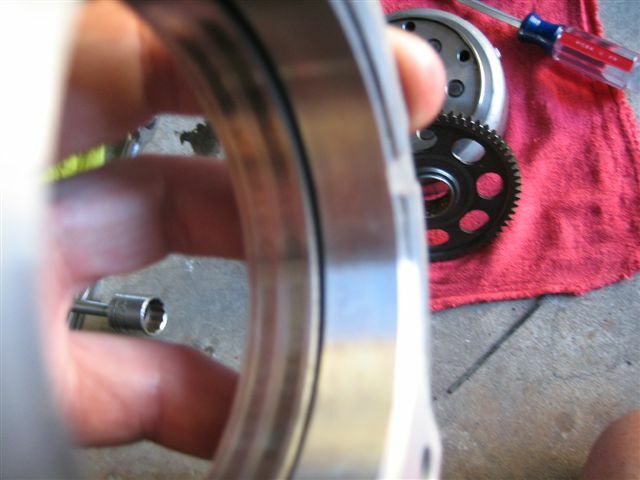 14) Remove the sprag clutch from the sprag bearing housing. PAY ATTENTION TO WHICH WAY THE FLANGE IS ORIENTED! 15) remove the sprag drive gear. 16) Check the condition of the inner bearing surface (brass with dimples). 16.1) The shop manual said 1.382 was the wear limit, my is at 1.378. Your can sort of make out the reading on the caliper. 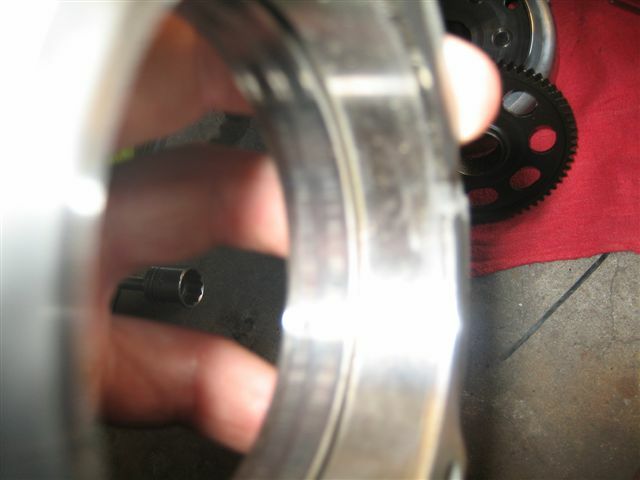 17) Check the condition of the sprag clutch (outer) surface. 17.1) should be smooth with not pits or signs of galling. 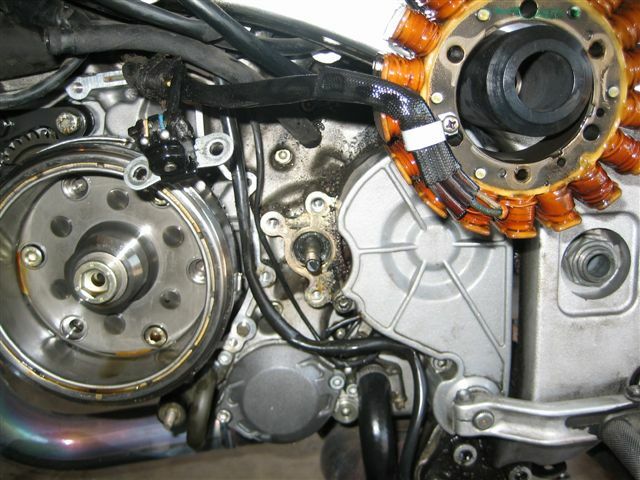 18) Check the condition of the sprag clutch. 18.1) All the engagement pieces should be polished and smooth. Again, my was smooth but I replaced it anyway. 19.2) The spring holding the whole thing together should be tight. Mine was quite loose. 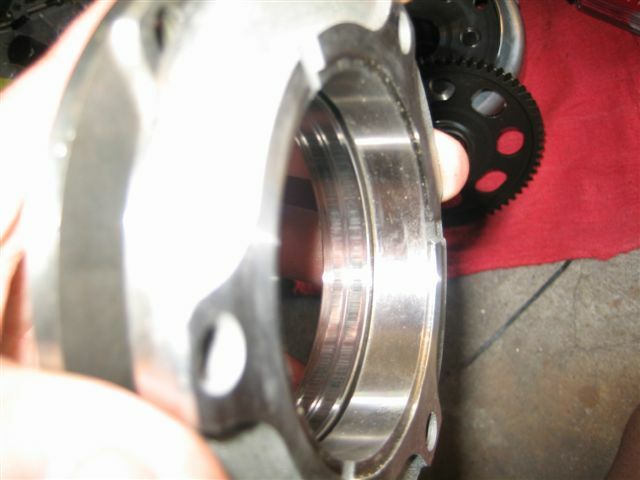 19) Check the condition of the sprag bearing housing inner surface. 19.1) The inner surface shoul be smooth with no gouges, pits or excessive wear. This is the part that was obviously bad on my bike. You can see the gouges worn into the surface. 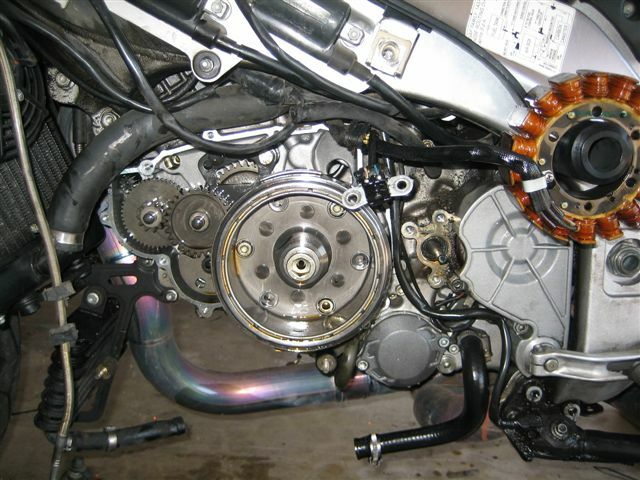 20) Replace the sprag clutch parts as necessary. 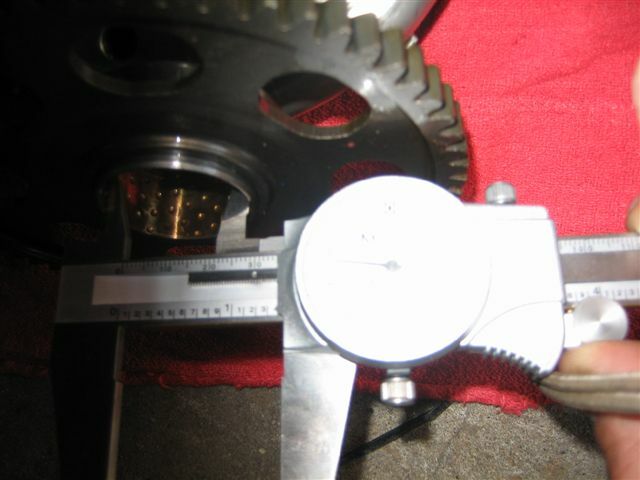 20.1) The flange side of the sprag clutch goes against the flywheel. 20.2) Use the snap ring pliers to squeeze the snap ring to insert the sprag clutch into the bearing housing. 20.2) Attach the bearing housing and sprag clutch to the flywheel. 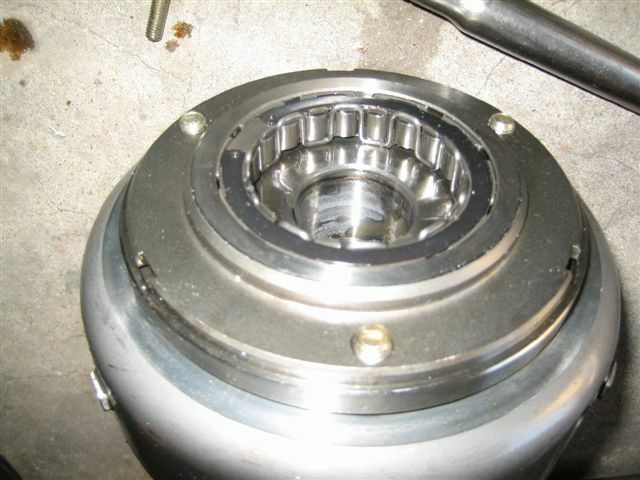 Follow the shop manual to apply the locktite between the bearing housing and the flywheel and on the bolts. 20.3) Apply locktite 648(green) to the crankshaft taper. 20.3) Getting the flywheel/sprag clutch on the sprag drive gear was a little tricky. You have to turn the flywheel in the freewheeling direction and kind of wiggle it to get it on. 21) Torque the M16 bolt down to 94ft-lbs. 22) Stop and check that all bolts are tight. 23) Remove the Aprilia Crank Holding tool. 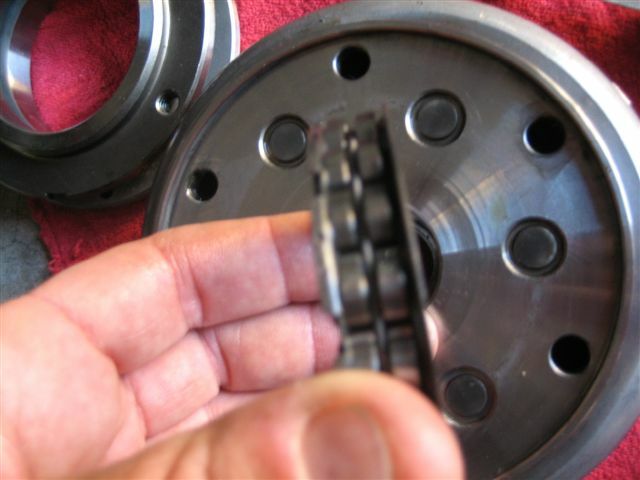 24) Make sure the sprag clutch works correctly: slips smoothly in one direction only. 25) Remove and replace the oil filter at this point if you chose to do so. 26) Using a new gasket, fit the alternator cover. 27) Attach the clutch slave cylinder. 27) Refill the oil and Check all fasteners are tight. I didn't take any more pics because I was too nervous at this point. 28) Make sure the Aprilia Crank holding tool has been removed! 29) Take a deep breath! 30) Say a prayer to the Motorcycle maintenance gods. 31) Fire it up and get the oil pressure up. 32) Get it warmed up and then check for leaks.